Have you ever tried making bead crochet ropes? If so, you will know how tricky it is to get started on the tube. Here are a couple of ways to tackle this awkwardness. 1. The first tip is from beadcrochetlessons where a Philips screwdriver (or Allen keys) are used to help maintain the tube in the beginning. 2. Sharon of Knot-Cha-Cha suggests using a starter tube. The starter tube may not be pretty, but the real section will be! 3. 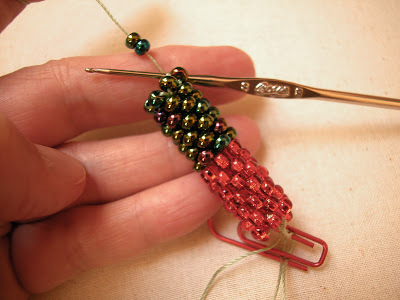 Fusion Beads has a tutorial on how to make an invisible join. This is so you can turn the bead crochet into a continuous rope for a bangle or claspless necklace. and needle and hook sizes. 5. There is a difference between slip stitch and single crochet bead crochet. They look similar unless you know how to tell them apart. The first one, slip stitch, is most commonly used - see this video tutorial by Candice Sexton. However, there are advantages to using single crochet. Reckless Beading has a great post on the pros. Thanks so much for your understanding and kind words. They mean a lot to me.